The designers of this game invite you to the place where you feel yourself a happy man! It is near the table of Island Craps. 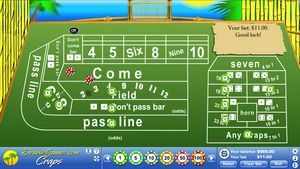 The object of craps is to predict the outcome of a roll of the dice.Island Craps with its excellent graphics, pleasant music and huge winnings is waiting for you!